A bouquet of beautiful roses can take anyone's breath away! 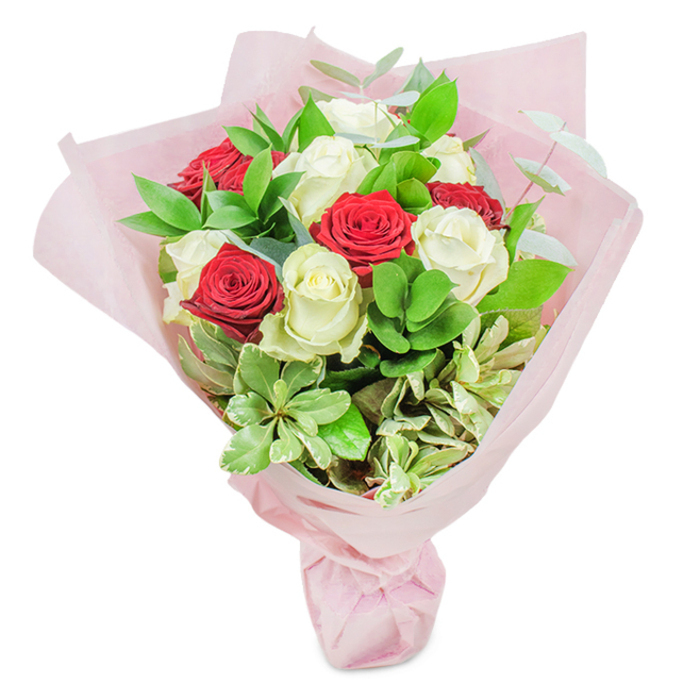 This magical combination of passionate red roses and pure white roses will certainly make any occasion more special for the people you love. Original bouquet pictured. Original bouquet contains 11 stems. I`m very careful with my gift choices because I always try to find the best option for my special people. I stopped on this bouquet because it looks simple, elegant, well arranged. Also - rose accents are always on style and my sister thinks the same, so thank you for the variety of flowers from your website, you`ve been very kind. Thank you for the amazing flowers. We received them this morning. A courier came this morning and delivered a box of flowers. I was totally surprised to open the box and see the most beautiful flowers! I love roses and whoever sent this bouquet to me knew me incredibly well. Delightful roses! Their team was really understanding and offered their assistance in every step of the ordering process. I really appreciated their help. Thought my wife will enjoy this bouquet. She certainly did. Thanks for your help and prompt delivery. I needed to find a decent-looking bouquet at rather short notice and I was lucky to come across this online flower delivery service. What they offered me was so much more than a decent arrangement – the flowers were magnificent, fresh and beautifully arranged. And they had a next-day delivery service, which suited me perfectly. Thanks! I ordered a bouquet online and when it got delivered, I was more than pleased with what I saw. The flowers were fresh-cut, artistically arranged and the total cost was more than affordable. Will recommend.